It’s hard for anything to top Antarctica, that’s for sure. 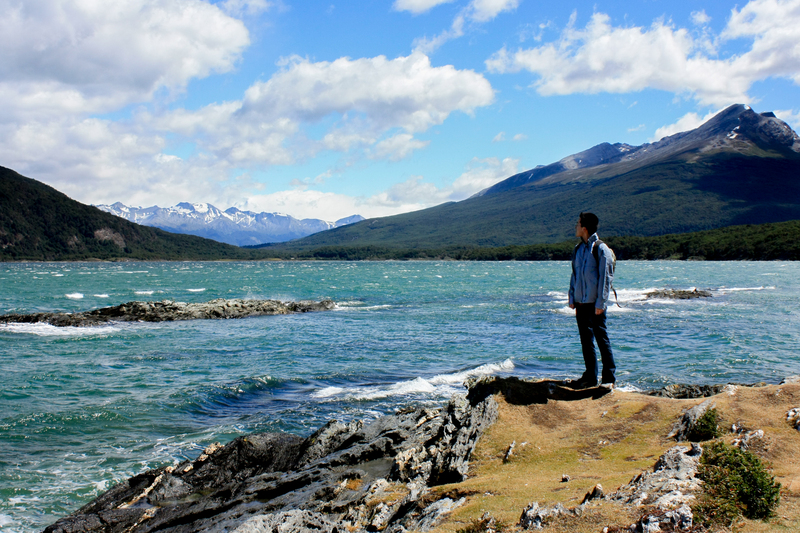 But I was rattled out of that mentality almost immediately during the drive to Puerto Natales – places are different. There are different things to appreciate. And that drive was beautiful – Patagonia is very flat, with lots of dry brush around. On our left were mountains in the distance, on our right was water. Plenty of animals around with so much space to themselves – sheep and ostriches on the sprawling estancias, and some possibly wild guanacos (they look like smaller llamas). Upon arrival in Puerto Natales, none of the three of us had any bookings, but Courtney and Simon both wanted single rooms to themselves, and I wanted a dorm. So we split up looking, though Courtney gave me some major help inquiring about rates in Spanish. We split up for the night intending to meet at the Torres del Paine briefing the next afternoon. Now that I’m back in South America, the language barrier applies again. I ended up at a hostel with absolutely no English speakers – the owners were very nice though, and I had a whole empty dorm room to myself. The only other guests were also Chilenos. Having been on a cruise for the last week that catered primarily to English speakers, my Spanish was suffering – which led me to go into survival mode. I’ve met many travelers who don’t speak a lick of Spanish – they tend to stick around foreigner-oriented hostels and keep their interactions with nationals minimal and just to bureaucratic things. That’s cool and all, and I really admire how they can communicate whenever they want something (I’ve met quite a few Japanese travelers who don’t speak Spanish or even English, which is sort of the de facto traveler’s language. I have so much admiration for them – I can’t imagine all the gesturing that comes necessary), but I really do enjoy speaking to other nationals. I attracted a lot of curiosity from the hostel staff and the other guests here, and I effectively became an ambassador for my country and heritage. No, Canada is not a land that only contains white people. Yes, there is a difference between Chinese and Japanese people. Yes, please come and visit Canada sometime! I have a much greater appreciation for immigrants now. You know, we expect people to speak English when they come to our country. We speak that to them immediately without assuming anything by looking at them. When they struggle for words, they don’t stutter in their home language and start speaking it slowly to us like we’re stupid, hoping we will understand. So when it comes to Spanish, why should it be any different? Even though I clearly look like a foreigner, people expect me to speak Spanish first. There are two options for travelers – either a simple “no hablo español” and brushing off attempts at conversation (which is fine! ), or inviting interaction with nationals or locals. Given that I want to interact, I feel like I should extend that courtesy by at least trying. But as a result, my three days in Puerto Natales were relatively difficult. I got by in Buenos Aires and Ushuaia with minimal Spanish, but here I had to make a serious effort in order to be understood. And also, Chilenos seemed super friendly – they initiated conversation with me very often when I was just sitting around in the hostel, and many on the streets would come and approach me if I looked like I needed help. But when I needed something – laundry, groceries, a fridge to store them in, a bottle of water from a convenience store, breakfast available at 9 am, a key, a room switch – and I didn’t know some of the words in Spanish, I had to learn to be creative. For example, when I wanted to say “after” (despues), a word I didn’t know, I’d say “no es antes (before), es…” *gesture*. But sometimes effort only goes so far. Eating by myself one night, a family of three from Santiago (Patricio, an electrical engineer – I had so much trouble learning the word “ingeniero” from him – and his son and daughter, Andre and Dominique) sitting beside me started talking to me in Spanish. I replied haltingly, and we soon had a hearty conversation over dinner. But Andre spoke a little English…and the rest of the conversation devolved into halting English, as he translated his family’s curious questions from Spanish. We did agree on one thing – Chilenos speak extremely fast. Even whenever I ask someone, “Hable más despacio, por favor”, their slowed-down version sounds just as fast and incomprehensible to me – it makes things very difficult for a learner. After a few days though, I am getting a little better, slowly. On my bus to El Calafate, Argentina, I met another guy from Santiago, Pedro. Again, the conversation starts in Spanish…then devolves into English. At least I got to learn a little more Spanish! (He saw my passport, and asked about India. I mentioned cows in English and he didn’t understand. “Cow…’vache’ en frances. Hmm…bife…?” Then he taught me the word “vaca”.) But I’m getting a little ahead of myself here. My original idea for Puerto Natales was to stay a couple days to prepare, then head to Torres del Paine for five days. After attending the information session (and running into Courtney, Simon, John and Catherine, a pregnant UK/South African couple, and Nigel and Sally, from the UK and just days engaged, all from the Antarctic cruise) though… I decided to chop it all down to a daytrip. 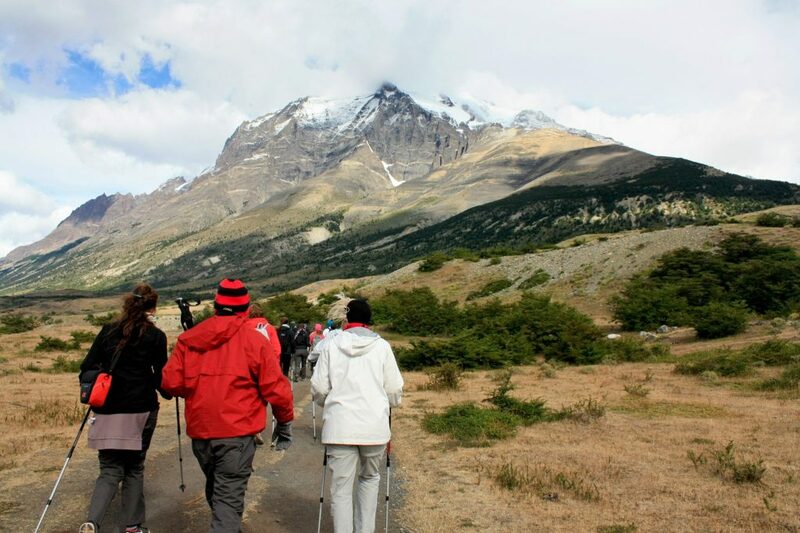 The normal route for Torres del Paine is either the 5 day “W” trek or the 8 day circuit. Given that there was a large fire recently, about one-third of the W is burnt, and we were recommended to do a 4 day “V” trek instead. Each day of hiking would still be many hours, lots of uphill stretches, and four seasons of weather in a day. As a result, you’d need good gear. It’s possible to rent, but still…after all the extra baggage from Antarctica, I wasn’t too keen on acquiring more items. Furthermore, there are several types of accommodation in the park. One is hotels – prime luxury, extremely expensive, and out of the question. Refugios (hostels) – but those fill up, and are $50 a night excluding sheets and blankets (more money). After splurging on Antarctica, I didn’t have the money for that. The last is camping. But I’ve never gone camping before, and barely even know how to set up a tent. You’d have to cook for yourself too (buying food in the park is prohibitively expensive), and bring a stove and all your food. In addition, there’s the possibility of high winds, driving rain, and snow (yes, this is summer) – without a partner to endure with, I felt that all these factors were a little too much for me. We all decided on different things – Courtney for 3 days, Simon for 1, John and Catherine for possibly the 8 day circuit (four months pregnant and roughing it! ), Nigel and Sally for 4. So! My only remaining option was a daytrip to the last line of the “W”, to see the namesake Torres in the park. This is typically a 4 hour hike up and less-than-4 hour hike down with a backpack, but as I was only carrying a daypack with snacks and a sandwich, I flew up in 3 hours and down in 2. I started off the hike with Simon and a girl we met on the shuttle, Ashley from Toronto. We peeled away from each other due to different paces after just 15 minutes. On my way up, I ran into Elsa and Olivier (France) from the cruise – like me, they had never done any camping before and didn’t have gear, but they decided to do 4 days…at least they had each other! At the mirador (viewpoint) at the end of the hike, Ashley arrived an hour after me, while I met Lisa, a chemistry teacher from Vancouver who was taking a sabbatical and had a similar itinerary to mine. Maybe we’ll meet again! 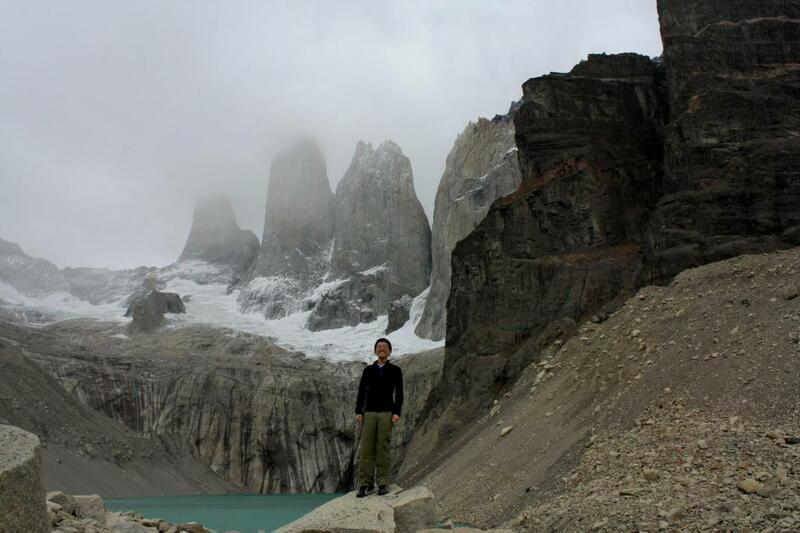 The peaks of Torres del Paine are indeed grand, but unfortunately, it was cloudy and snowing. By the time Ashely reached the peaks, they were completely invisible. I’m glad I at least caught a sight of them before they disappeared, but as a result, I felt that the hike up and down (even the drive to and from the park) was nicer than the big reward at the end! I stayed at the mirador for an hour and spotted a few condors, but the peaks did not reappear (nor did they for the rest of the day, so I’m glad I left when I did – it was freeeeezing). This was absolutely not an easy hike – and it made me glad I made the decision I did. With no hiking boots, it was a little tricky – the hike was 9.5 kilometres each way and very steep uphill (total 900 metres or so). Though I was very good on time, and even flew by the other one-day hikers, I learned that I’m not such a big fan of trekking, and after the heavy winds, rain, and snow I experienced, I was very glad I was not camping or having to set up any sort of structure. But maybe someday I’ll return with more outdoor experience, since the scenery was quite beautiful! 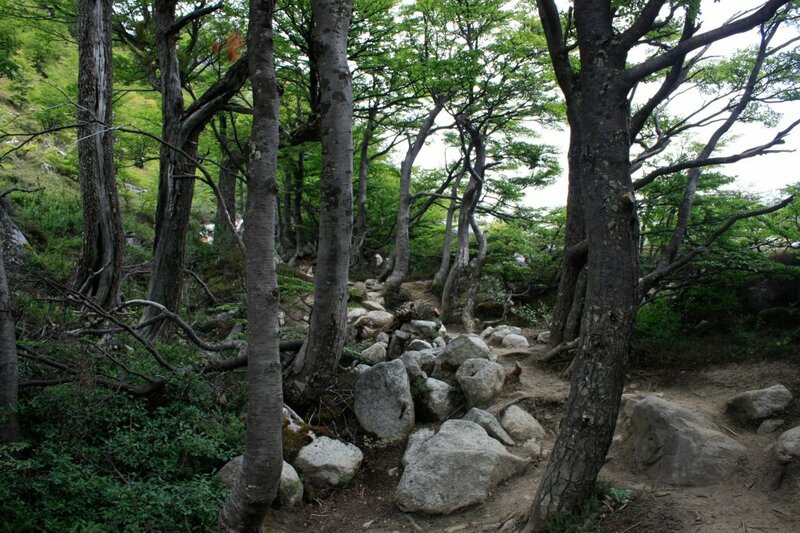 The weather started off quite pleasant and cool, and the view down from the mountain was spectacular and typical of Patagonia – sprawling flatlands, gently rolling hills. There was definitely no lack of drinking water – the glacial water from the many streams around was fresh, clean, and refreshingly cold. Ironically, having cut 7 days from Torres del Paine and Punta Arenas, I am now AHEAD of schedule for my original plans before Antarctica. Still, I now hope to play everything by ear. I came into this whole trip with the mindset that I’d try anything – but well, I gave in this time. At least I put some effort into it!